Sports Roses Homecoming Mum Ideas 1 « Sports Roses. Your passion for sports…expressed. Mr. Billy Baseball wanted to ask a special Texas sweetheart out to homecoming, but he knew he would need to get her the perfect homecoming mum to win her over. 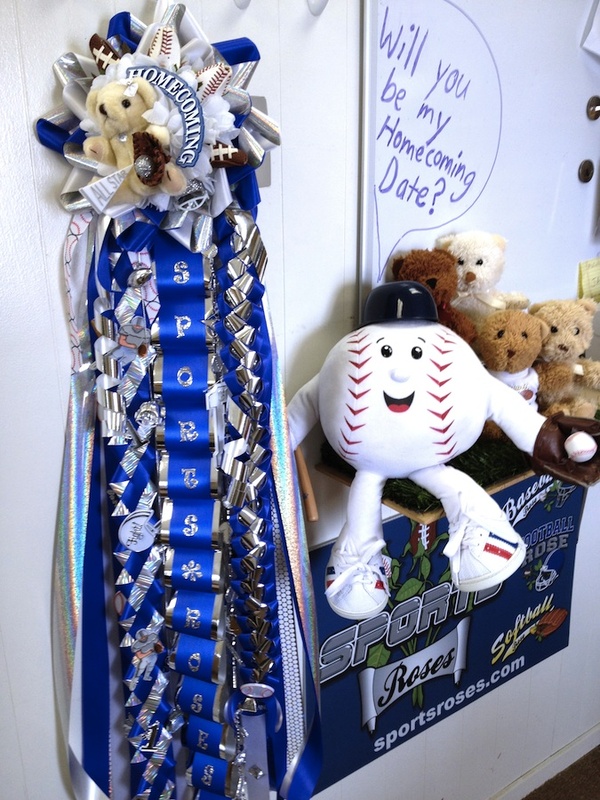 He created a one-of-a-kind Sports Roses Homecoming Mum that was sports-themed and featured his favorite sport baseball and his second favorite sport football (his date better loves sports too). His high school colors are blue and white and he’s a senior so he made sure the mum featured lots of metallic ribbon. The crowning feature on his mum are two Baseball Roses and two Football Roses that were adorned around the mum. Other baseball and football themed trinkets and embellishments were also added as accessories on the mum.